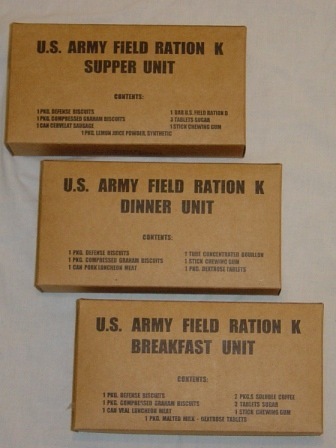 A variety of K ration reproduction boxes showing the waxed inner cartons at the bottom. Who haven’t heard of the infamous K ration? The staple diet for the frontline men. It contains all the nutricial stuff a man needs, but lacks bulk. 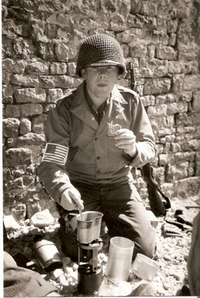 Intended as an emergency ration and should be eaten for only a few days, the GI’s lived on them for weeks on end on them. And, yes, most of the time eaten cold! 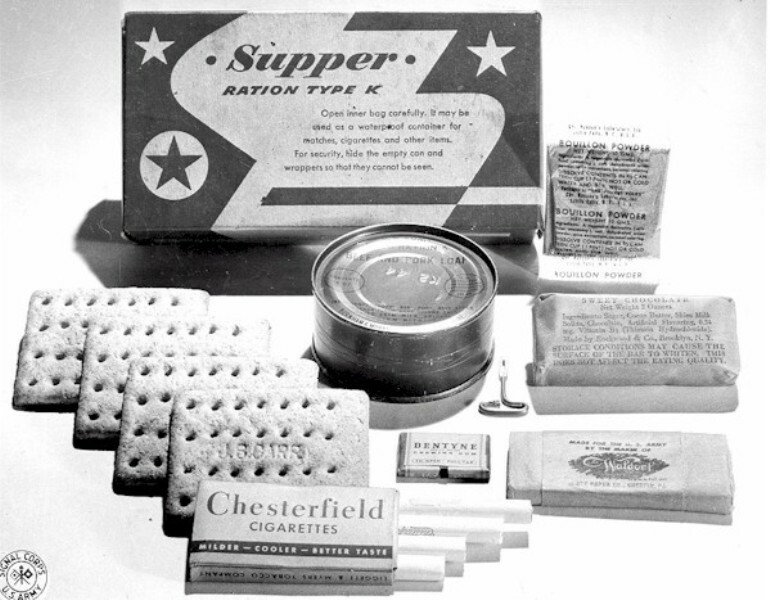 But most of the time it was just the old K ration with its dogbiscuits, acid-drinks, greasy egg/cheese/meat product, and, thank God, cigarettes! 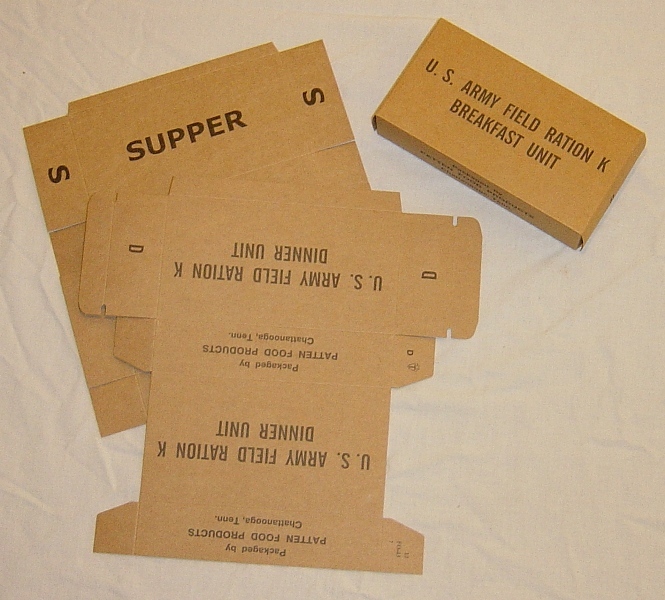 Being a printer, I printed a helluva lot ration boxes for reenactment use. Filled and glued shut, they have to be ripped open. Nothing better than torn boxes littering the place! And the waxed inner box can be used to heat that coffee. To portray the GI to the fullest, we made ourself some field rations that we can use. There’s nothing worse than having to stand in line at a snackbar for some fries and a can of Coke. No. 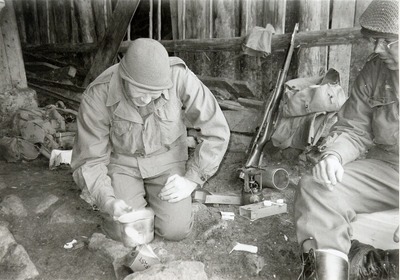 Wanna do it the right way, you settle for some K ration and, hopefully, some warmed soluble coffee. 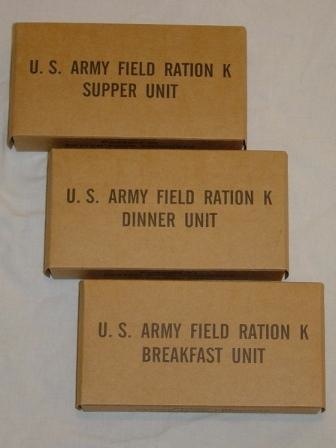 All you need is a K ration. An original one is just a little bit expansive, and probably unpalletable after all those years. Best thing to do is to use a reproduction filled with the goodies you like. What to fill it with? Well, some biscuits (crackers, that is), a drink, a can with some kind of meat product, sugar and candies. 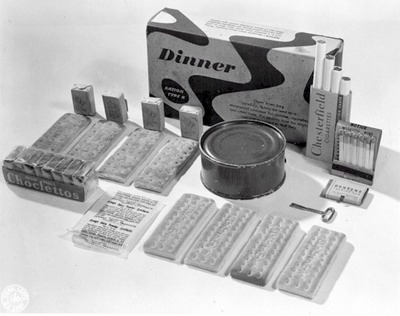 Mandatory are the cigarettes, for most of the GI’s smoked. Although we’re non-smokers, I do put them in there just for the authenticity. Lest to forget that chewing gum! Extra’s like the matches and toilet paper are included as well. 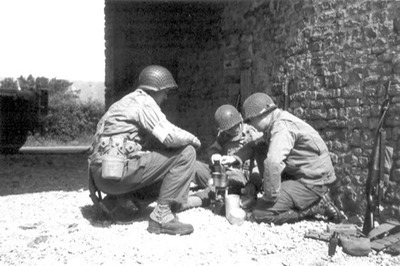 There are three main types to use. First one is the early mass production that is used in the early campaigns in North Africa, Sicily and southern Italy, and the early campaigns in the Pacific like Guadalcanal. 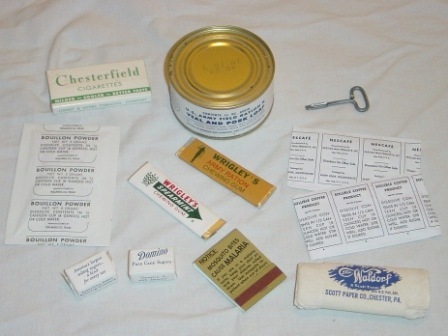 These boxes have a listing of the contents printed on the outer box (front panel) and a warning not to litter the area (back panel). 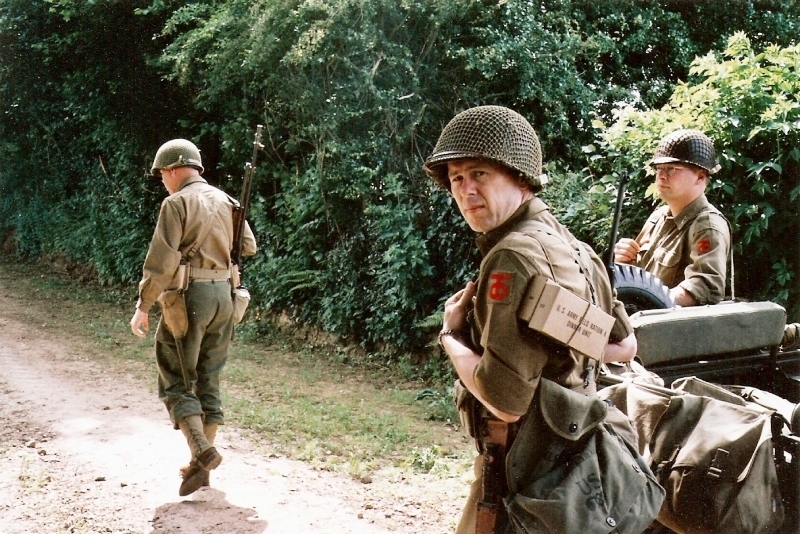 The second one we use is more typical for the later half of the war, say 1943 and onward till the end of the war. These boxes were just printed with text saying what type of ration it is and who packed all the stuff in that little box. 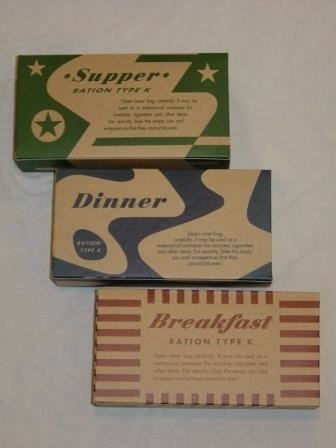 In May 1944 the suggestion to make three different colored boxes for the meals to identify them more easily was approved and went into production. This third type appeared at the front late August an more likely early September. 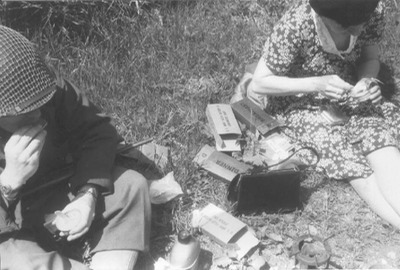 Although different outer boxes were developed and fielded, the inner box remained more or less the same. 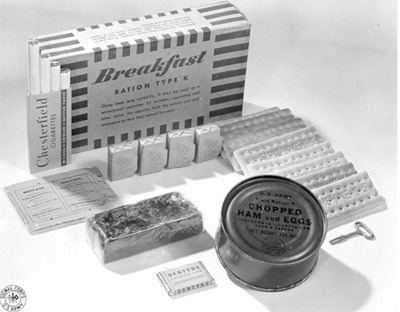 It was printed with the type of meal in bold letters, so it was still readable after it had been coated with wax to waterproof it. Some variations had the names embossed in the board instead of having it printed. 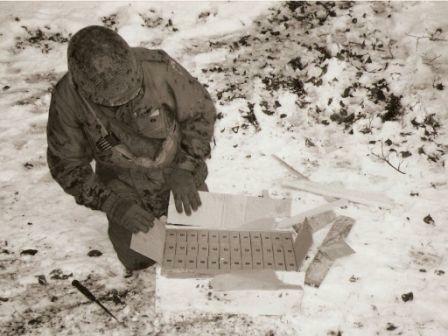 Maybe this was a method of marking left to the manufacturer in case he was unable to obtain printed boxes. 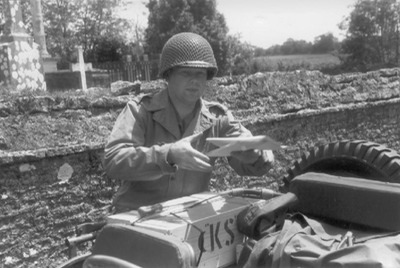 For the second type of outer boxes goes the same thing, different ways of marking the box can be encountered. 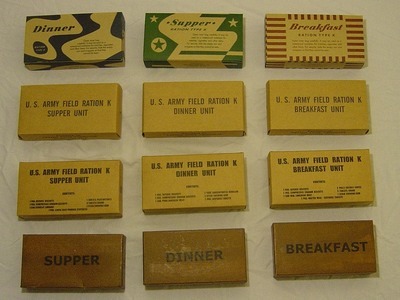 Sometimes it’s marked “RATION K U.S. ARMY” with the type of meal following, or the printing isn’t centered, but done in the lower right corner. Again, this was probably left to the manufacturers to decide. 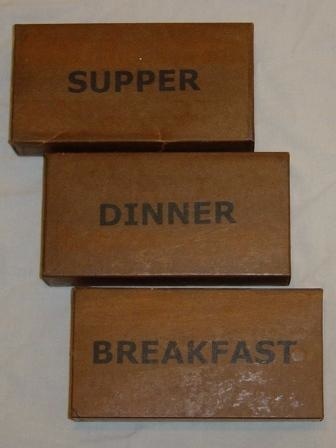 Having these boxes filled with your choice of food, you can settle down on the curb and start brewin’ that cup of “Joe”. How to heat a cup one third full of water takes some practice. Best way is to put the waxed box right up with the open end on top and to punch some holes near the bottom. Then you light the box at the top and you let it burn down slowly while holding your canteen cup over the flame. This would do the trick. Enjoy!